Amazing spot in the Gulf of Mexico, El Cuyo is still an unknown place for most kiteboarders. Very few know that there are many windy days here. It is also one of the best spots in Mexico and North America for learning kiteboarding. The shallow waters, which allow you to see the sand lying on the seabed clearly, fill beginners with confidence. El Cuyo is a small fishing village in the Mexican state of Yucatan, with about 1,750 inhabitants. It is a fishing port located at the north eastern end of the state, near its limit with the state of Quintana Roo. It belongs to the municipality of Tizimín and is located within the Biosphere Reserve Rio Lagartos. After the construction of new roads, the distance with Cancun, Playa del Carmen, and Tulum has been reduced, and with an average of a 2-hour drive you can get to this idyllic town. 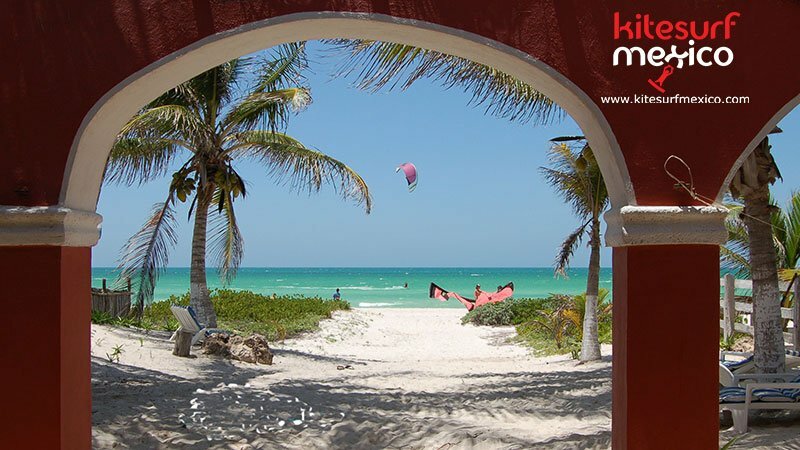 This authentic hidden treasure is located in the emerald coast of Yucatan, in Mexico, just 30km from Holbox. El Cuyo is located 220 km away from Merida, capital of Yucatan state, and is an attractive touristic spot in the far eastern Yucatan coast of the Gulf of Mexico. It is a destination in full development, mainly oriented to ecotourism or adventure. Around the town are places of great natural attraction, being especially recognized the estuary called Rio Lagartos, among other reasons, by the abundant and permanent presence of flamingos that coexist with other 250 species of seabirds.